For the 1966 season the FIA dropped the minimum windshield width regulations. The narrower windshields helped improve the top speed of the cars by around 15 km/h. 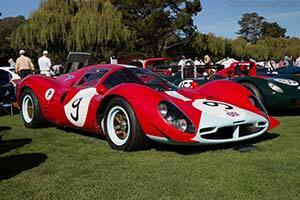 Alarmed by Ford's 1965 pace, Ferrari set out to revise the P2 to suit the new regulations and bring it up to GT40 speed. In Ferrari tradition, modifications were made to the already reliable chassis. Sleeker than ever, the P3 featured fiberglass doors. It was the first time the Maranello based team favoured the lightweight material over the aluminium used on the previous prototypes. The clutch was relocated from right behind the gearbox to between the gearbox and engine. The gearbox was a new ZF five speed unit. Lovely looking, but now getting outdated, the six Weber Carburetors found on the 330 P2 were replaced by a Lucas Fuel Injection system on the P3's engine. The engine provided slightly more power, but the wider track added some weight, giving the P3 a similar power to weight ratio as the P2. Three P3s were constructed. Results in the opening races of the season were promising. Piloted by Mike Parkes the P3 won the 1000 km races at Monza and Spa with John Surtees and Ludovico Scarfiotti respectively as co-drivers. Luck changed for Ferrari as labor problems at the factory prevented proper preperations for the 24 Hours of Le Mans race. Down on development time, none of the P3s made it past the 17th hour of the race. In contrast, Henry Ford had his Le Mans victory with a stunning 1-2-3, a feat previously only displayed by 'those fast little red cars'.